Hi, my name is Moko, and I am a bamboo craftsman from Bali. I've been working with bamboo for years now, and have gained an appreciation for its amazing properties from my family, which has worked with it for generations. 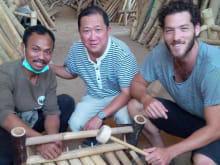 I currently teach a jegog class near Ubud to give guests a chance to make their own musical instrument and occasionally give tours of the famous Green School and bamboo mansions as well.